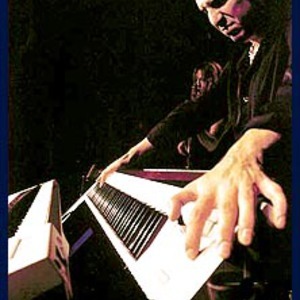 Derek Sherinian is a keyboardist based in Los Angeles, California. His most notable achievements are as a member of the bands Alice Cooper, Kiss and Dream Theater. Sherinian has been called the "King of the Keys" and the "Caligula of keyboards" due to his performing style. His influences include Jan Hammer (Mahavishnu Orchestra), Keith Emerson (Emerson, Lake & Palmer and The Nice), Rick Wakeman (Yes), Elton John, and a variety of guitarists. Sherinian endorses various equipment, including Korg and Clavia keyboards. He is of Armenian and Greek descent. With Dream Theater, he recorded the albums A Change of Seasons (1995), Falling Into Infinity (1997) and Once in a Livetime (1998) before being replaced in 1999 with Jordan Rudess due to creative differences. Since 2000, Sherinian has recorded several solo records on which artists like Yngwie Malmsteen, Zakk Wylde and Steve Lukather have lent their talents. Most notable of all Planet X, recorded with Australian drummer Virgil Donati, which led to the formation of the group of the same name, as Sherinian and Donati decided to expand on the concept by recruiting guitar virtuoso Tony MacAlpine. Since 2002, Sherinian has been regularly touring with Billy Idol as well as recording several tribute records. Sherinian's fifth solo album, Blood of the Snake (2006), features Zakk Wylde, John Petrucci, Yngwie Malmsteen, Slash, Billy Idol, Steve Lukather, Simon Phillips, Tony Franklin, Brad Gillis, and Brian Tichy. The latest Planet X album, Quantum, features Allan Holdsworth among others. Sherinian cites Eddie Van Halen's guitar playing as having a direct influence on his unique approach to keyboards in terms of technique as well as tone; his unique "Monster Lead" lead patch contains numerous elements of guitar sounds such as distortion, harmonics, and palm-muting. Sherinian's collaborations with top musicians were featured in a 2007 article in Guitar World magazine, where guitarist Zakk Wylde offered ?People want to play with him because he's that good. He can play everything from the easiest licks on a piano to the most complex Beethoven sonatas with ease.? Dream Theater guitarist John Petrucci added "...Derek-considering the fact that he's heavily into guitarists and rock music, his history, and the range of all the great guitarists he's worked with?plays with a fire unheard of from most keyboardists.? Sherinian explains that he enlists a variety of guitarists because he "[does not] think there is one guitarist who can cover all the styles featured on [the] albums." Sherinian often tailors songs for specific guitarists, such as Holdsworth and Wylde for "Day of the Dead" (off Mythology). In this respect, he seeks to take certain aspects of genres and make them "collide in an eloquent way".